It’s no secret that I love a good pom pom accent piece. It’s also no secret that I am loving straw bags this season! 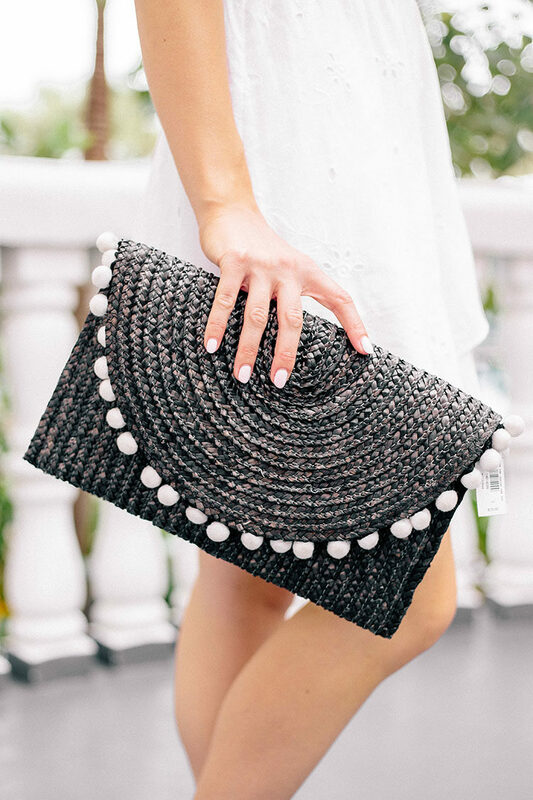 So when I came across the perfect combination in this straw pom pom clutch, it was impossible to say no. I found both this $28 (!!!) clutch and this eyelet wrap dress from Express, a store I haven’t shopped at in a while, when planning for my recent trip to Florida. I was pleasantly surprised by the cute, trendy and well-priced summer pieces they had in stock and made a mental note to browse there more frequently! Exhibit A? I also ordered this coverup for my trip and am in love with it. Any stores you’re excited to shop at this spring and summer? I’m all ears! I’m excited to shop at J.Crew Factory – I generally find it a hit or miss but when I went in last weekend I wanted one of everything! Plus their tees can’t be beat – a flattering non white t shirt is so hard to find, and theirs are under $15! Ahh, this dress would be perfect for my bachelorette party!!! That is seriously the cutest outfit! I also love that cover up you ordered! Express has some really cute pieces this season! What a cute summer outfit and that bag is so gorgeous.